June's Corn and Beans block complete! This one is really colorful. 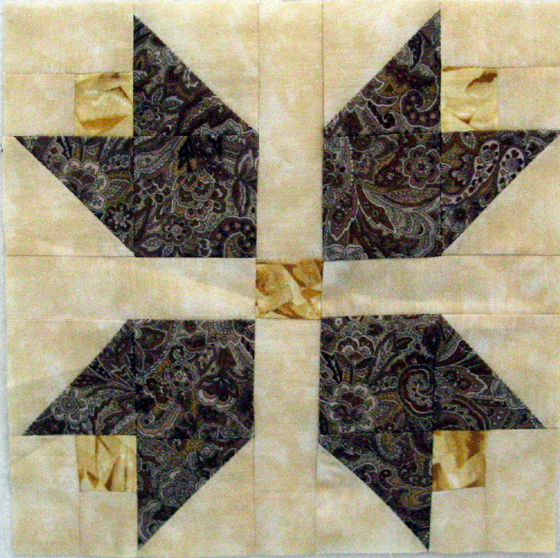 I tried to add back in more of the browns and cheddards that was used in the first two blocks but you can see it was a feable attempt. Looks like blue won out on this one. I do love it though. 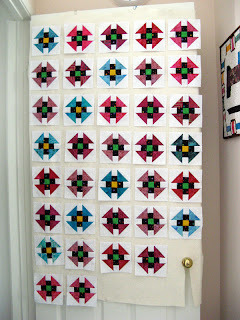 I'm finding I like the more colorful blocks since March's Trip Around the World block. I still think they'll all work together in the end. 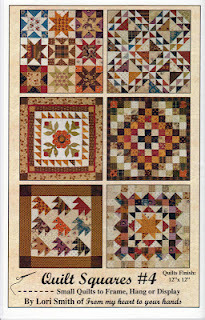 Can't wait to hear what Jo selects for July in this Quilt Square Quilt Along with the wonderful designs of Lori Smith in her Quilt Squares pattern series. 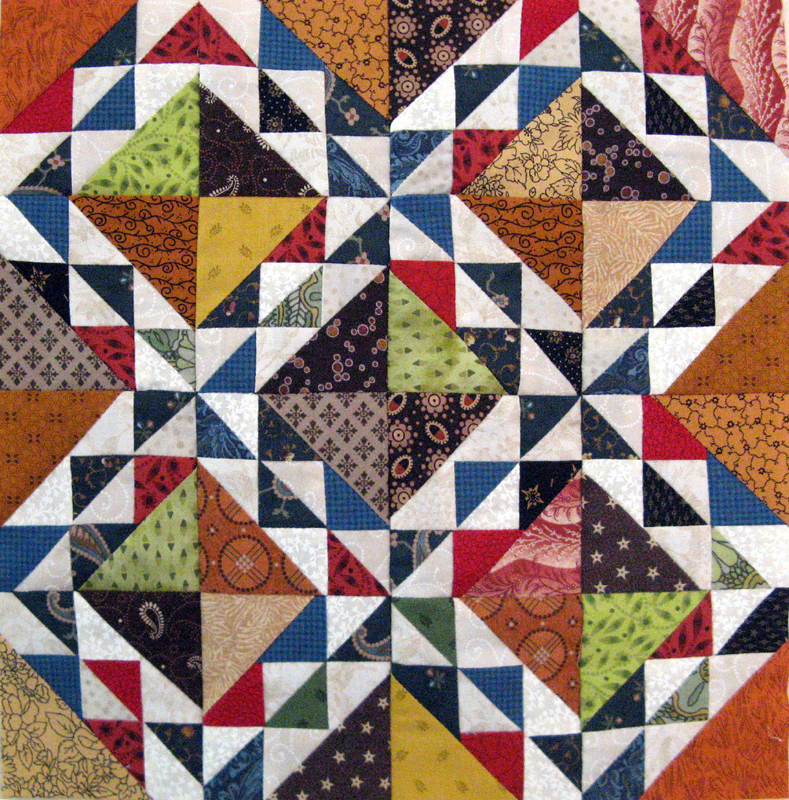 This block comes from Quilt Squares #4. I'm off to a little exercise then meet up for lunch with Kerry. 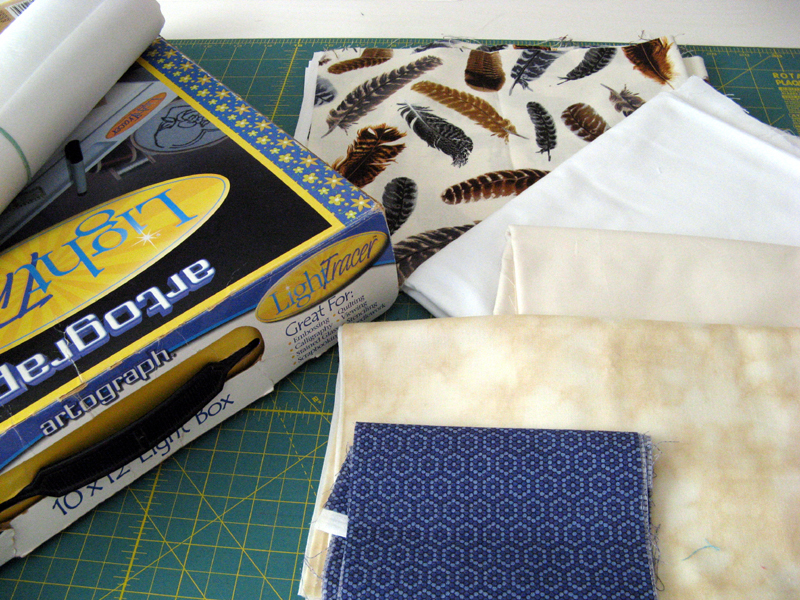 When I'm in that area I'll be stopping by at Quilter's Choice to see if they have any of the fabrics I'm looking for. I need three different novelty fabrics; a black and white 1/4" check, a clown themed fabric for borders, a dog themed fabric for borders. Enjoy your Saturday. It's a good thing I got started on this last night. It opened up my eyes that it will take a fair amount of time to sew up. 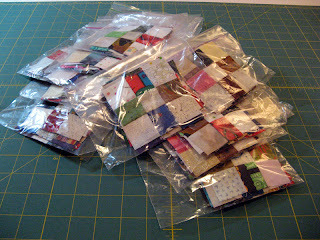 I got all the HSTs...at 1" finished eek...sewn. I've cut all the other pieces and put sets together. I've got to make 16 of these 3" finished blocks and you'll see in the photo that I've only finished one. 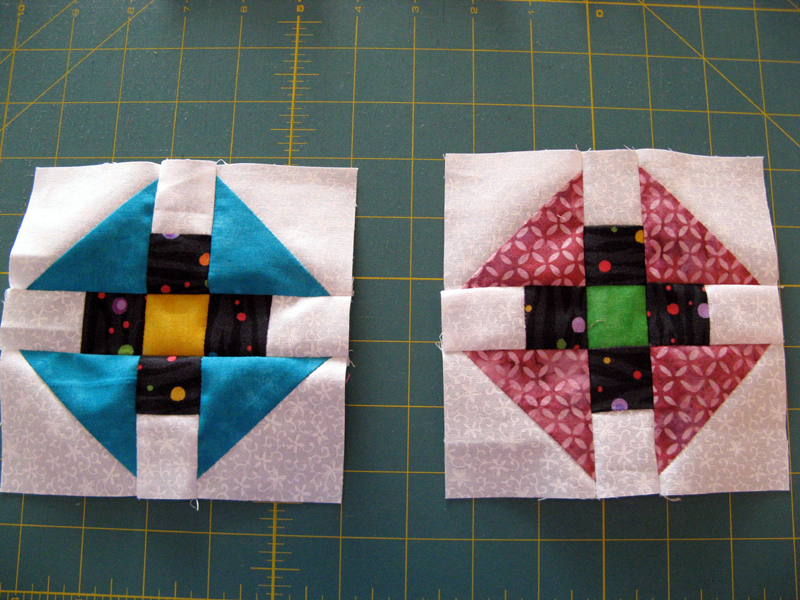 Today during my lunch break I'll be squaring up the HSTs that are three for each block. I'll put a bit of sewing in on them tonight before date night! I'm going to be busy on Saturday, June 30th getting this monthly project done that's for certain. Today another Crabapple Swap arrived at my doorstep! Four more to go...two are set to arrive on Sunday, a third is expected Monday evening, and I'm waiting to hear from the fourth. Teresa, your blocks look great. I think by Wednesday next week I'll be ready to pass them out. 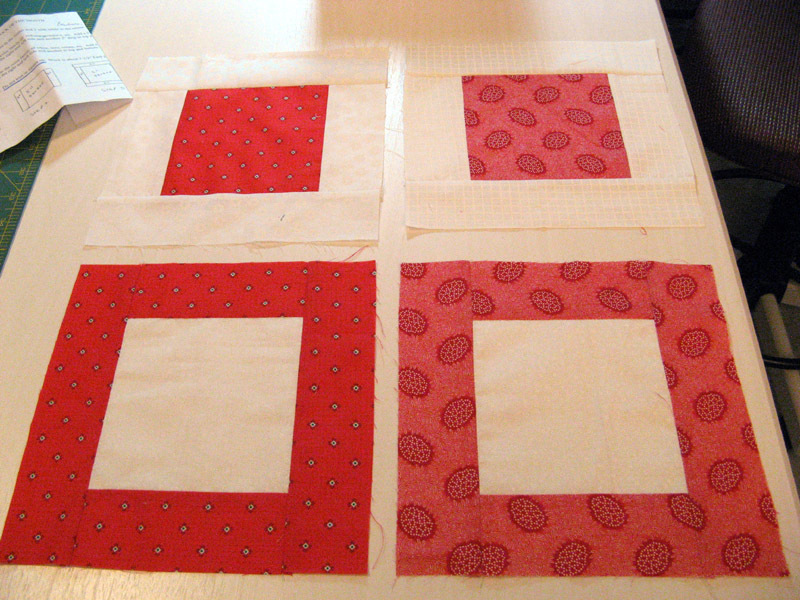 Keep your weekend open if you are anxious to get these cute 9-patches sewn into the sky and borders of your Crabapple project. Today thankfully is HUMP DAY! A long week for me considering last week I had two and a half days off. This week it's five full nine hour days. 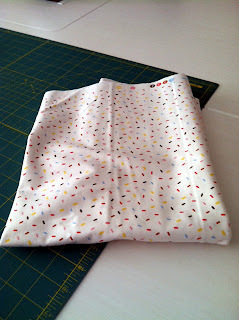 I took a lunch break looking for this fabric that will be the sashing for the Hot Air Balloon quilt of my Mom's. 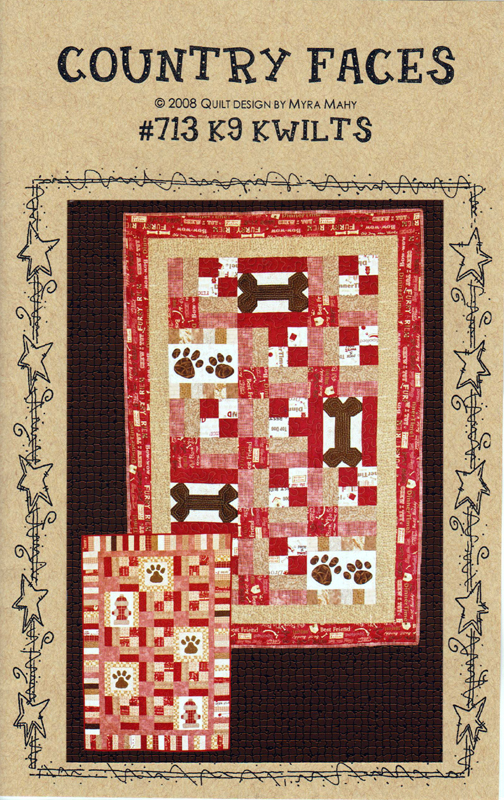 I was also looking for a border fabric for the San Diego Humane Society quilt (pattern shown #713 K9 Kwilts) that Kerry and I will be donating for the 26th Auunal Fur Ball to be held August 25th. I went first to Quilter's Paradise in Escondido where of course I found something to purchase...but of course not what I was looking for. I've purchased this fabric once before and loved it. It was at the end of the bolt so...I brought the rest home. Next on the way back to the office I stopped at Bits and Pieces also in Escondido and was more than surprised to see the store closed. I took out my iPhone and tried to track down where they may have moved to without luck. I don't recall any notice of them closing. I sure hope not as I really liked the shop. I recall the taco shop that was next door having a fire and smoke damage to lots of the fabrics, but certainly not a closing of the store. Calling the shop gave me a change of number which I tried but no answer. A search for location only gave me the one I was sitting in front of. Looks grim...anyone know what happened? 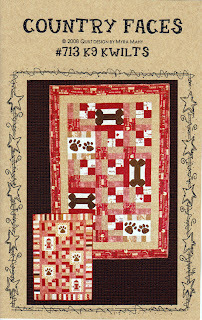 So I'm still in need of a black and white ~1/4" check and 5/8 yard of dog theme border fabric. 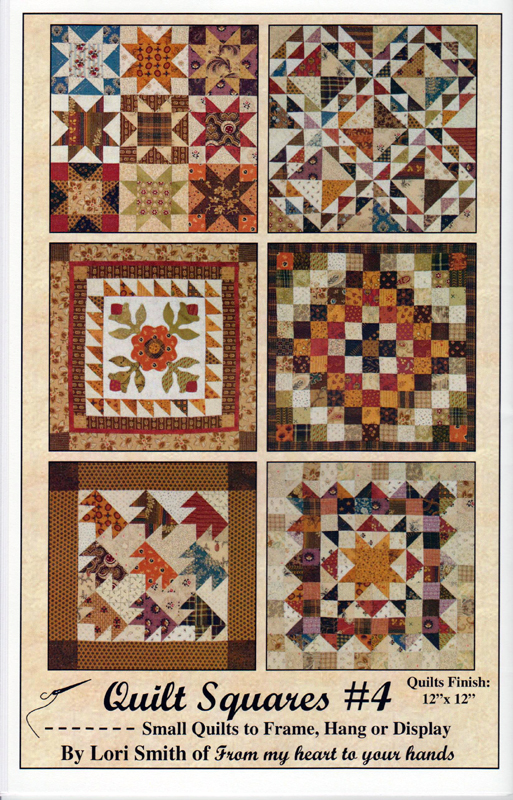 Kerry is going to look at a couple of the quilt shops in the south part of the county in the coming days. Hope she'll have some luck. If not this piece from Quilter's Paradise might just need to work. 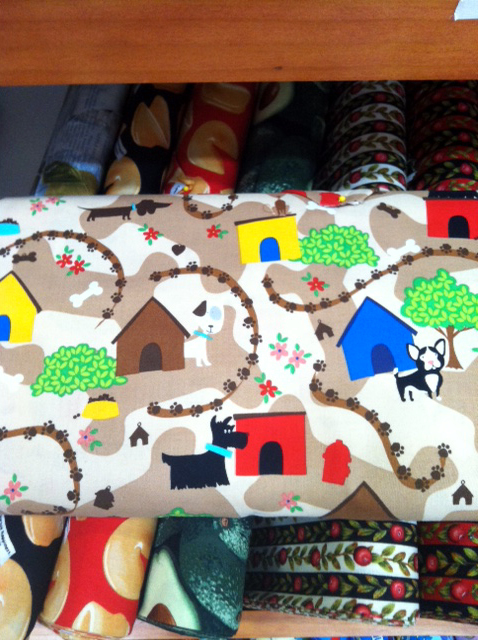 Novelty dog fabric is not so easy to locate. Meanwhile I continue working on Klowning. 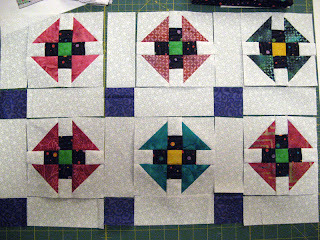 Have all the blocks together along with the sashing. Rows are next! The mail person brought me Susie's Crabapple Swap blocks today. They look great Susie. I know you had a tough time getting them done recovering from your recent elbow surgery. Get better quick we'll be doing another swap in the not too distant future. So that leaves five more to turn in...you know who you are!! Since I finished my June UFO so quick, I decided to get a start on another UFO that hasn't yet been selected. This one is Klowning. 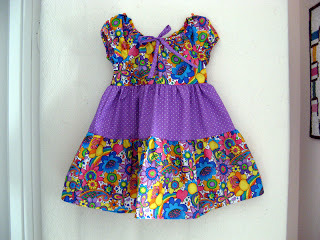 It's a Bonnie Hunter design called Little Monkey that is FREE on her website. These are the 36 blocks it will take. I've decided on a purple for the cornerstones of the sashing. 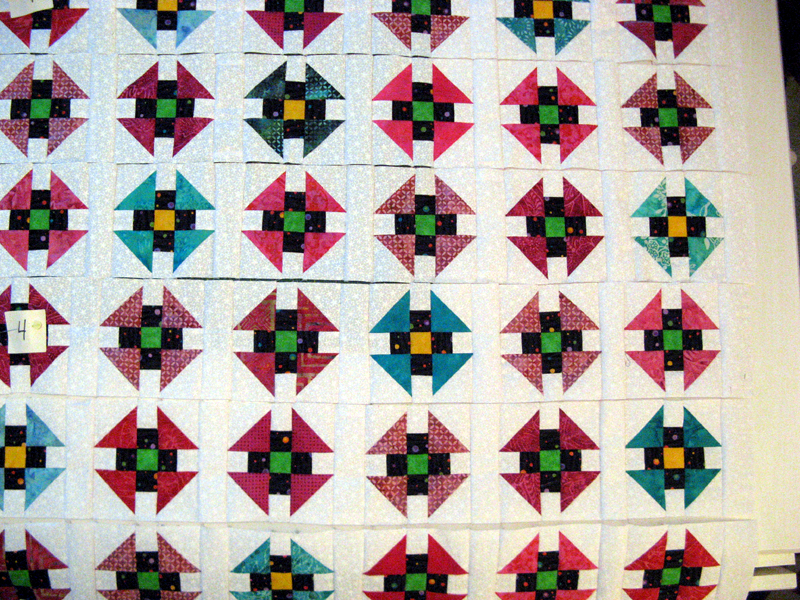 This one is going together super fast as the HSTs were already finished; leftovers from my Kerfuffle quilt made earlier this year. The 2" green or yellow centers were already cut too. 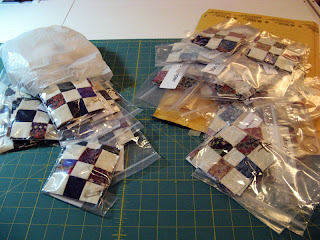 I found the black multi dot and more of the white on white for the connector squares and the sashing. 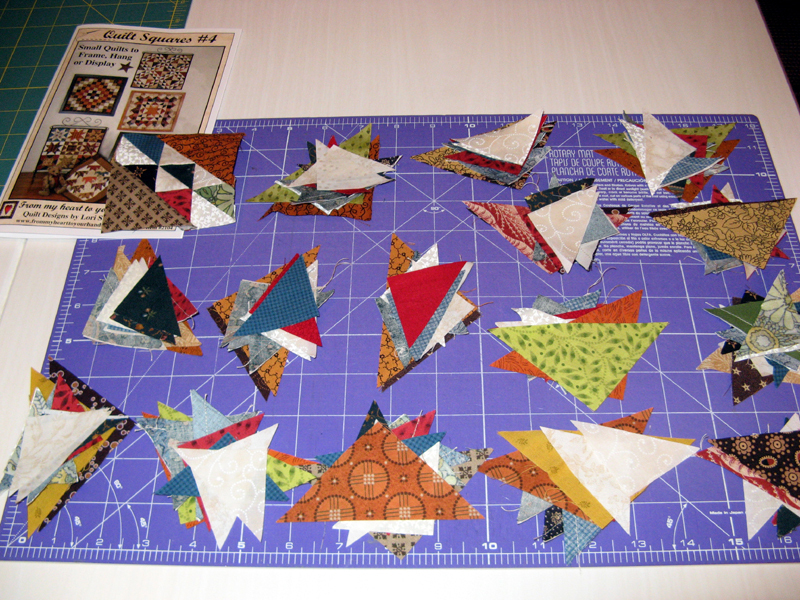 I've spent Sunday evening cutting out my Quilt Square Quilt Along block that's due the end of the month with Jo's Country Junction. It's the Corn and Beans block at the top left that I'll be making. All these squares become triangles. The smaller squares (1 7/8") become HSTs. I made an attempt to go back to cheddar and brown as the primary color, but still pick up the newer fabrics I've been adding the last three months. So what's on your Design Wall this last Monday in June? See others if you have the time at Patchwork Times. I mentioned having spotted this cute pattern and fabric on a trip to Joann's during my Mom's recent visit. Yesterday was a nice day to whip it up. Seemed funny to be sewing with a 5/8" seam =^.^=! I will be sewing more on this project today. It is one on the 2012 UFO list that hasn't been selected yet. It is a Bonnie Hunter design call Little Monkey. I'll be calling mine Klowning :)! All pieces except the black dot and white connector strips were already sewn and cut. Getting to the chain assembly was easy. When I made Kerfuffle a few months back I made way too many HSTs which has turned out to be perfect for Klowning. I'll be making 36 of this block that get connected to sashing with corner stones and a border. Today is my DH's Birthday. I'll be treating him to a dinner out and a surprise coming into his email box...he loves this kind of surprise. The Birthday card I selected for him is all too cute (of course it must meet the "cat on it" criteria =^.^=)! I thought I'd do a shout out for a friend of mine who just recently opened up a quilt shop in Leonardtowne, Maryland. Olde Towne Stitchery, LLC. Kathie has been getting fabric and notion deliveries in nearly every day or two since her doors opened. She's building her class schedule too with some nice projects. Don't know if you happen to be in her neighborhood, but if so find your way to her shop. Tell her I sent you :)! Kerry's been at Asilomar all week with Brenda Papadakis. She took her week long workshop last year and is becoming a regular. About half of the attendees this year are returnees according to Kerry. She's assembled 20 blocks so far; each and every one look great. Pictures are coming to her blog soon. I finished my Crabapple Swap blocks last night with the pressing. I'm happy to have this project complete...for now. 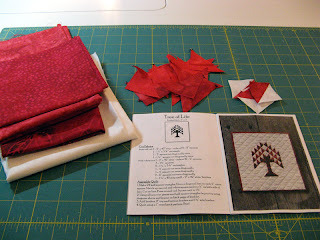 Next up and the last project that needs to complete in June is my Quilt Square Quilt Along Block with Jo's Country Junction (there's a link on my sidebar). 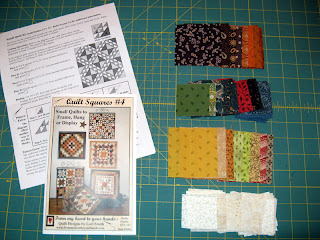 I'm to make a Corn and Beans block (top right) from Lori Smith's Quilt Squares Pattern #4. More to see on this in the coming days. Check back on Sunday to see how I'm using up my fabric stash! Happy Weekend. Eleven have turned in to date. I'm still not yet finished with mine...tonight might be the night. 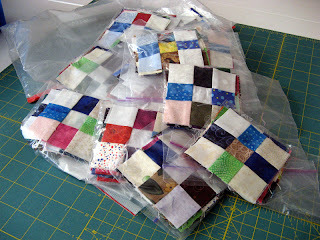 There are seven busy sewing for a June 30th due date. Mom left yesterday :(. Her flights were all good through to Tampa where she'll spend some time with my Brother and SIL before heading back home to Maryland. We had a great visit and are both already thinking of the next time we'll be together. I'm trying to encourage her to come in late September when the next weekend sewing retreat is scheduled. My presentation on Monday night at Canyon Quilt Guild was received very well. I ran over five minutes, but that wasn't too bad. It seems that there was a favorite quilt for everyone. A bunch of photos and questions were fielded about patterns too. It was great that my Mom was in town at the time otherwise she wouldn't have had a chance to be at one of my presentations. Thanks Canyon for the opportunity to share my hobby. The next "sharing" will be for Friendship Quilt Guild in September when I will teach No Klucks Here! at Quilters Paradise. Last night once again I was disappointed with the Oklahoma City Thunder loss to the Miami Heat. They play so good or are down with a strong finish, but sadly miss the win by just a couple of points. Down 3-1 in the series of 7 games looks grim for the young Thunder team. Today is Wednesday which means the rest of the week is down hill from here. Hope you are getting everything done as you'd set out to do at the beginning of the week. Happy sewing! Labels: Crabapple Swap, No Klucks Here! 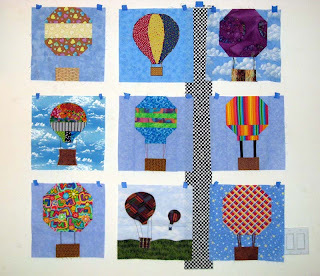 Hot air balloons is what you can find on my design wall today. 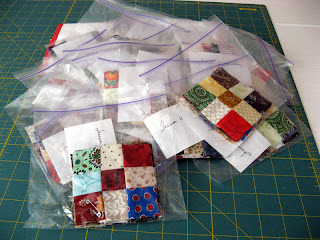 These are a collection of blocks from an online swap that my Mom participated in a couple of years ago. 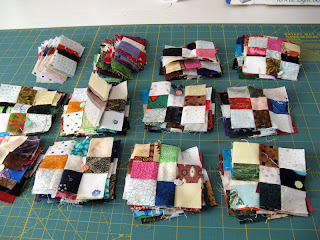 There are three additional blocks that will find a home on the back. 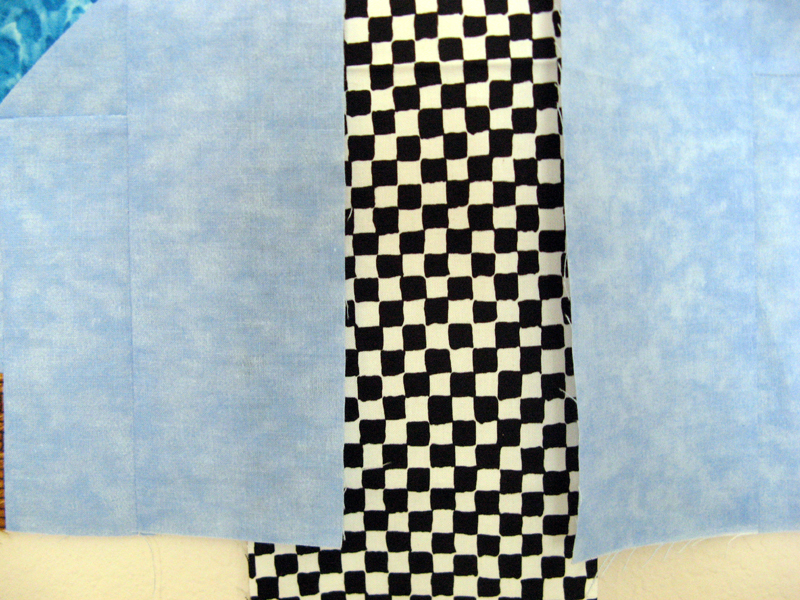 We went to the fabric store, two in fact, neither had a black and white check that we've decided would look best. There are too many different blues to deal with. Black and white seem to be just the right choice. When we were black and white check shopping we couldn't resist this pattern for Morgan. 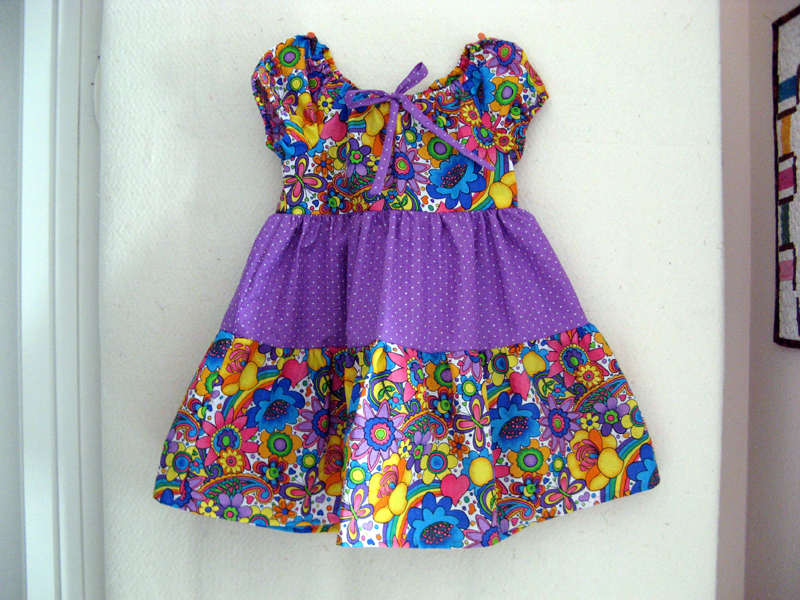 She loves pink and purple along with girly dresses. This one was so cute made up on the store's display. With the 50% coupon we had and the half off pattern...nothing to stop us. Mom's time with me is dwindling :(. I'll be back to finishing up my Crabapple Swap blocks tomorrow night. These along with the Quilt Square Quilt Along block are a must to be done by the end of the month. Have a wonderful week sewing. 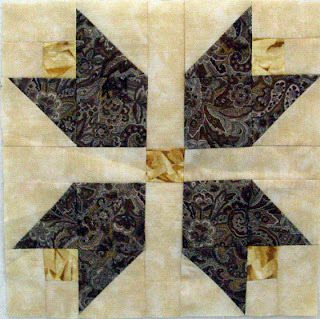 See other Design Walls today at Patchwork Times. I hope you are treating your men as they should be on the one day in the year set aside for them. My Dad is spending the day working on his home in Maryland. He's always tinkering around with something to keep everything in order and him busy. I sent a card with a Lowe's gift card earlier and I gave him a call today to see what he was up to. Sure wish distance didn't separate us so much...I'd be grilling him up some baby backs! Not much new to share today. Kordova Klosure is complete...binding, sleeve, and label done. I'll be sharing this one along with several others tomorrow at a presentation that I'll be giving at Canyon Quilt Guild in Kearny Mesa, CA. Since this one is HUGE at the great suggestion of my Mom I'll be putting it on a quilt rack. 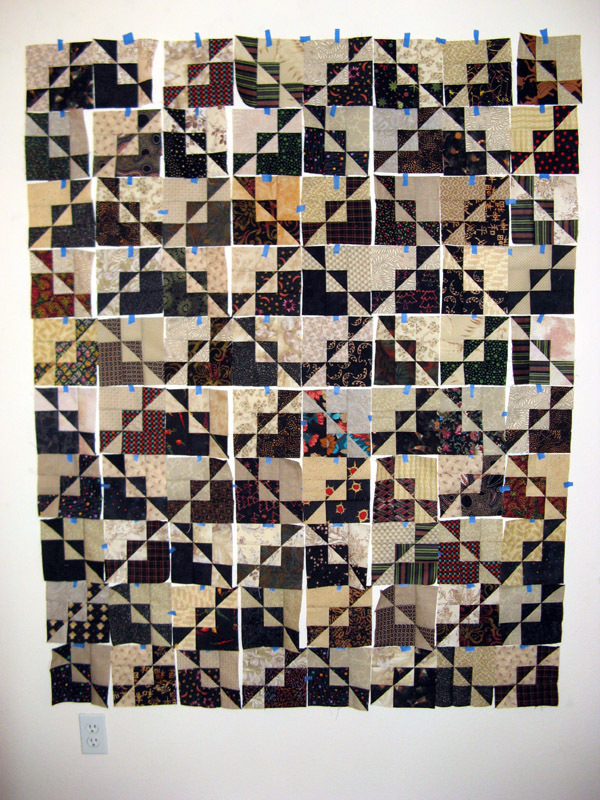 It is the last quilt I've completed... didn't think I'd ever finish the binding around this 100" x 108" quilt. The pattern is Bonnie Hunter's Orca Bay design that was a mystery started in November 2011. It is one of the several string designs featured in her newest book that will be available in July or August. 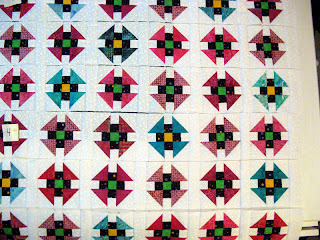 If you want to preorder a copy you can do so on her website www.quiltville.com. Mom and I have been using some stash. 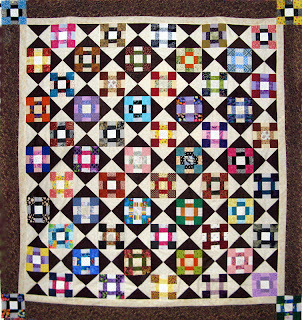 The inner border and back were assembled for her Chunky Churndashes quilt and some to complete the third border of her Round Robin. 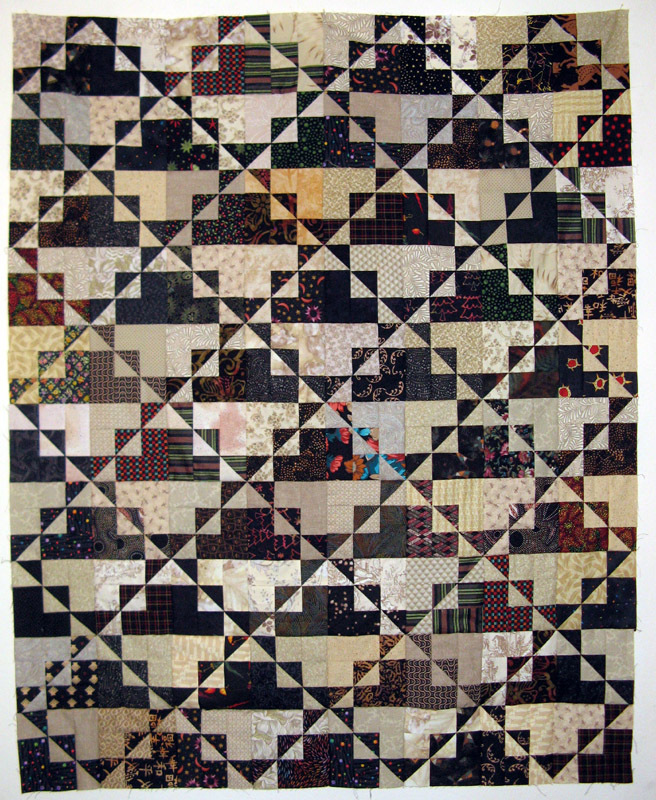 We got done with Mom's Chunky Churndashes top then went to work right away on the pieced back. All done with both! YIPPEE! 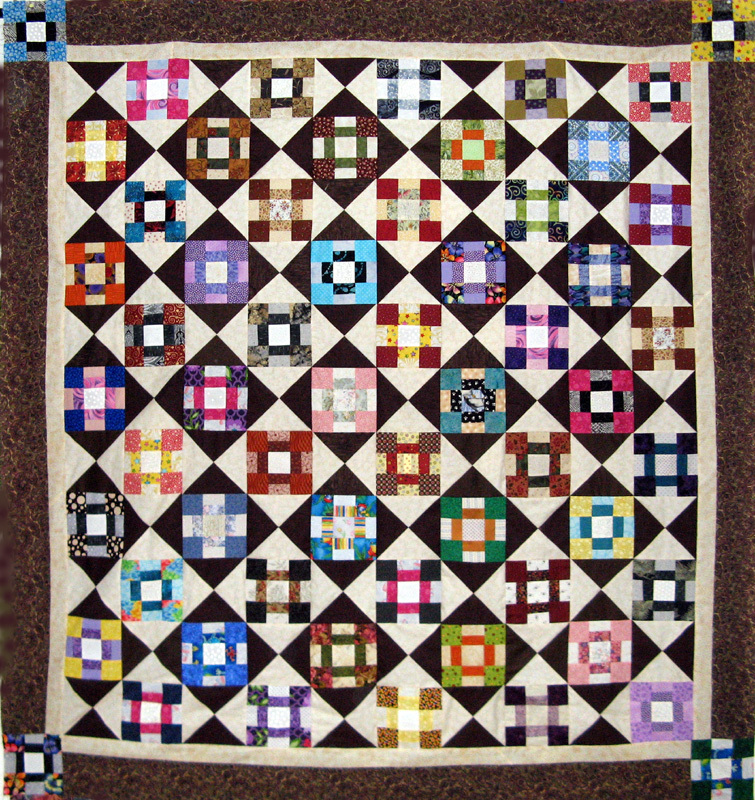 One project completed and ready for quilting. There were four of each churndash and hour glass blocks left so of course they went to the back :)! Another Crabapple Swap turned in. This one is from Karen. Everyone is doing a fabulous job this time grouping and identifying their offering. It will make it so much easier to sort out for everyone when the time comes. I spent the morning finishing the binding on Kordova Klosure (in my PJs =^.^=). 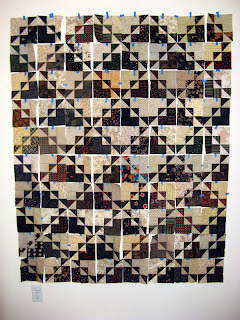 I'll be getting this HUGE quilt on the rack shortly for photographing for my post tomorrow. It finished 100" x 108". Like I said HUGE! Another swapper has turned in 9-patches. Each and every turn in brings the number closer. 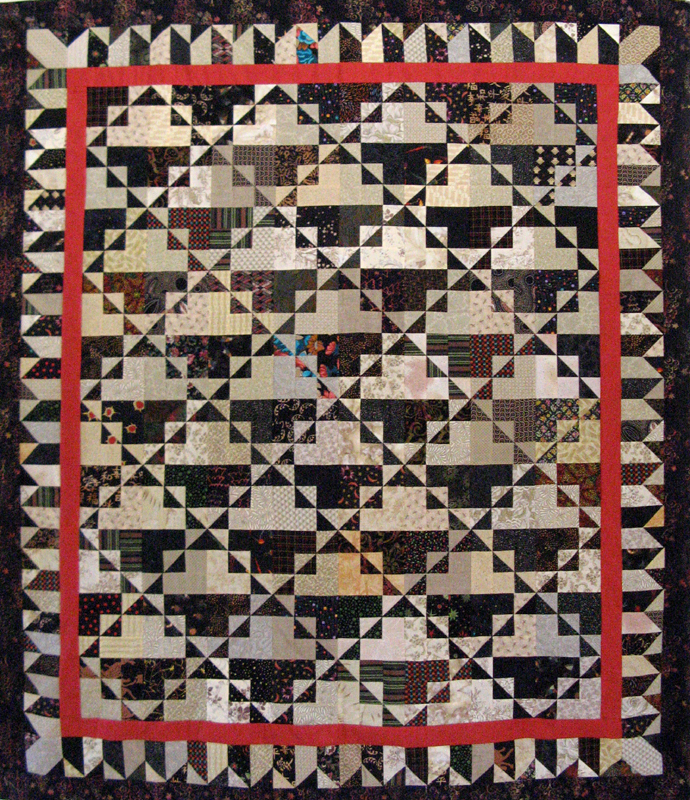 I suspect that Monday might bring me more when I go to Canyon Quilt Guild's Monthly meeting. If not the postal service will be delivering lots more over the next two weeks. I'm still not done with mine :(! Mom and I have been real busy getting all of her projects done that we set out to accomplish while she's here. 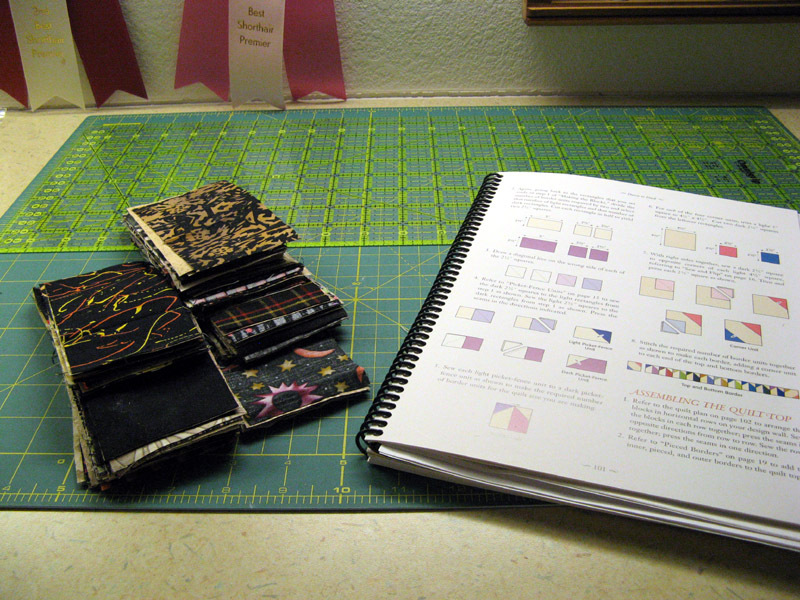 In between I've been busy binding Kamile and Kordova Klosure. I was asked to give a lecture and trunk show at Canyon Quilt Guild's Monthly meeting this month as part of what is being called "Member Spotlight". 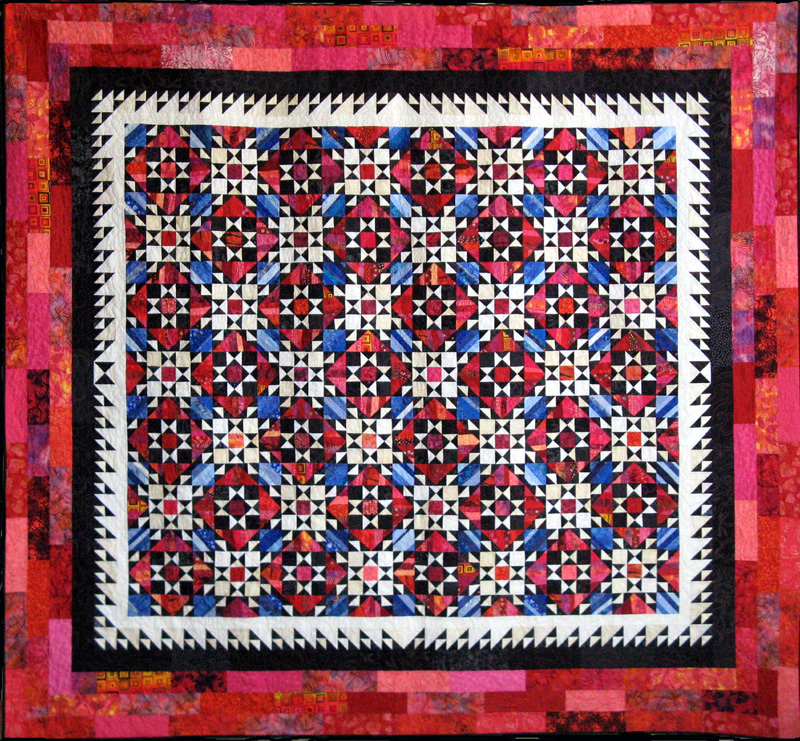 My presentation will focus on Traditional Quilting. 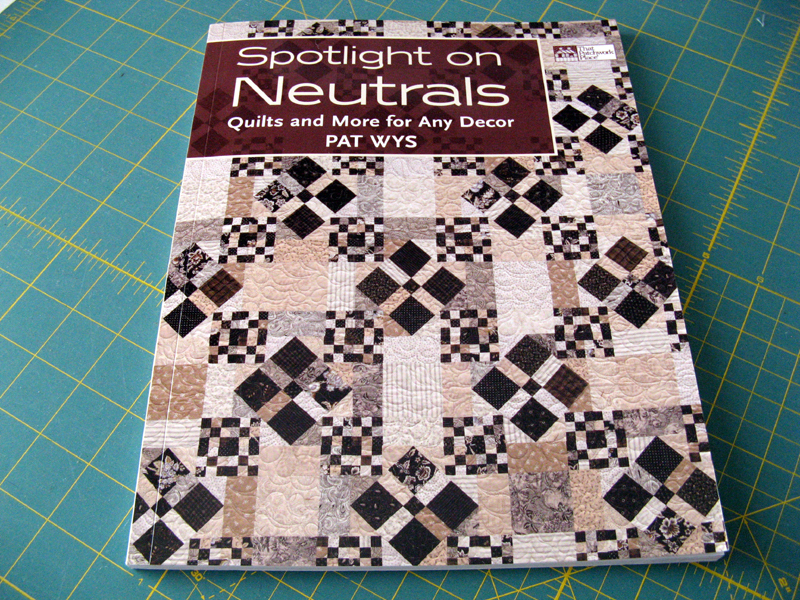 Wendy Knight will also present with a focus on Art Quilting. Now let's see how many quilts can fit into two large suitcases! Last night's project was finishing Mom's Chunky Churndashes. She's busy today putting on the borders. 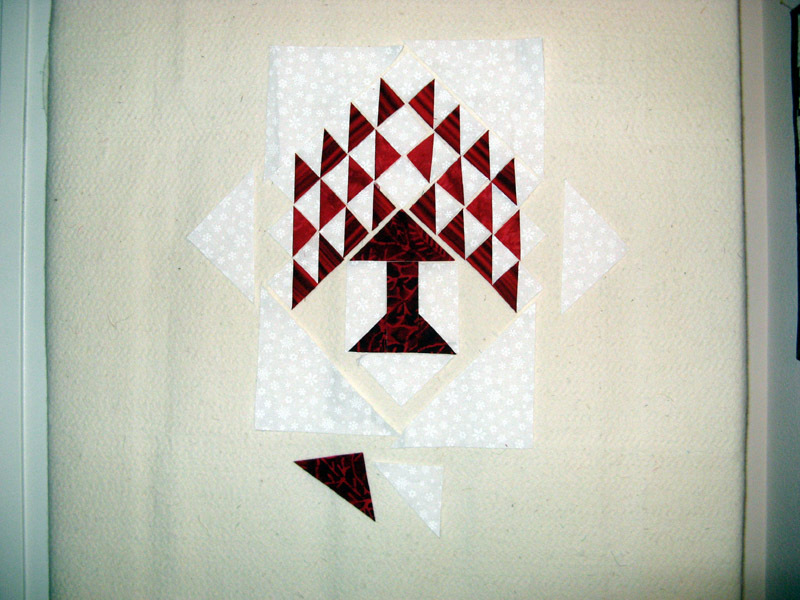 She had several churndash blocks left so four will be used for the corner stones along with a two pieced border. The rest of the churndash blocks will be arranged on the back. 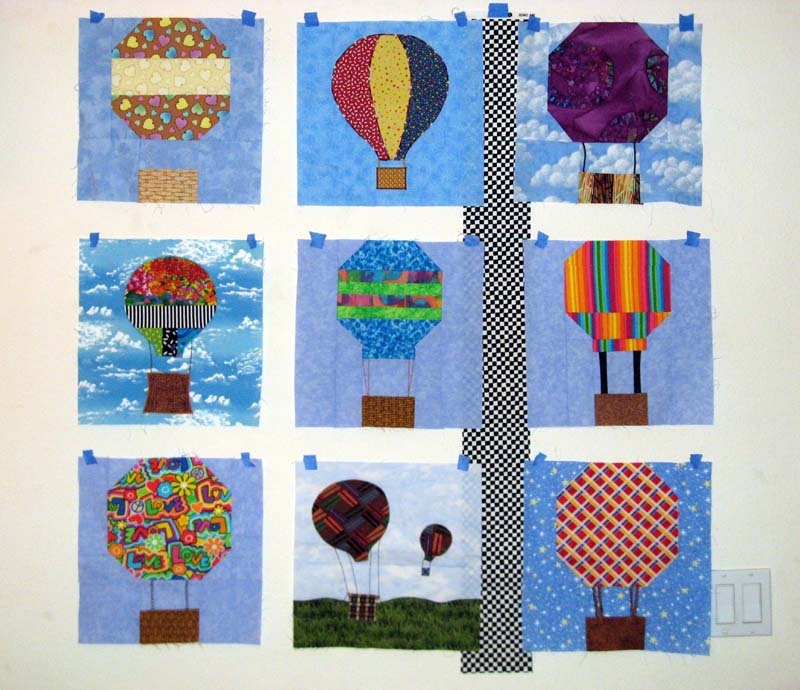 Next to work on are hot air balloon blocks from a swap she participated in online a couple of years back. She brought these last year but we ran out of time. Time is running out again, but this one is going to get assembled...it won't go back to Maryland in pieces! 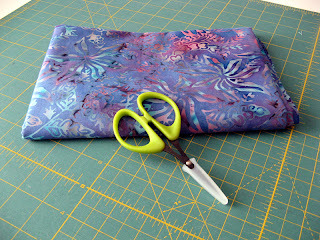 Then there's the round robin to pull fabric for...purples? greens? definitely a bit of black. Strings? Anxious to see how this one comes together. 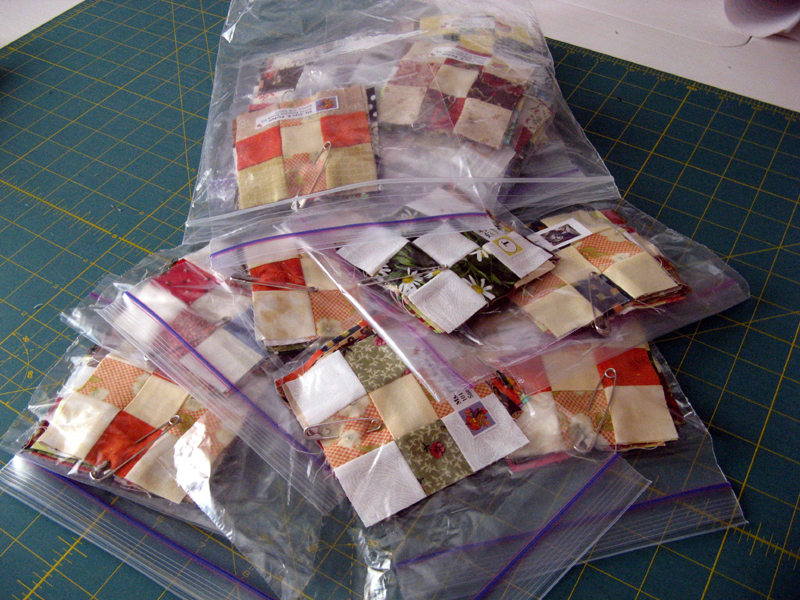 I should find time to finish the remaining 9-patches for my Crabapple swap while Mom's busy stitching. 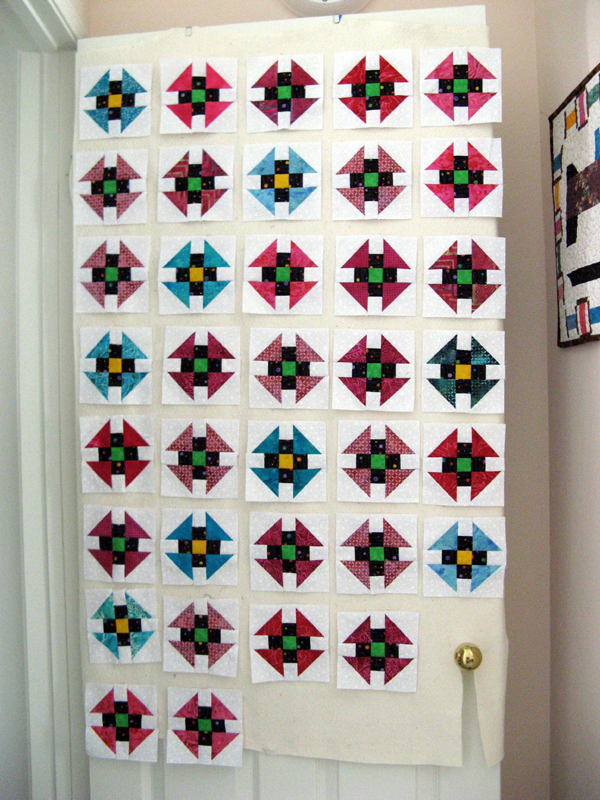 Then there's my Quilt Square Quilt Along block to finish before the end of the month. Enjoy your sewing projects. UFO Done! This is June's UFO #12 with Patchwork Times. So nice to have it done. I can't think of anything to call this tree with a "K" except Koppice. Yes :( I realize a coppice is a small group of trees and this is only one, but what else is there? Suggestions? 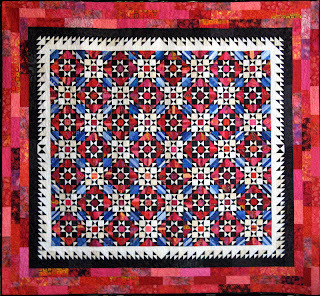 The pattern comes from A Collection of Small Red and White Quilts that I picked up last year at the Temecula Quilt Company in October. It is Tree of Life that finishes 11" x 13". 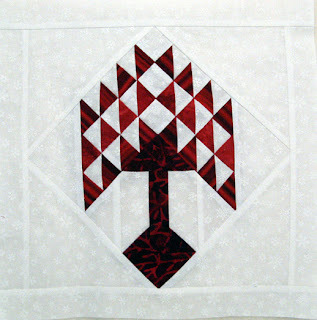 I'm going to try to crosshatch the quilting with a scale that is the same as the HSTs. 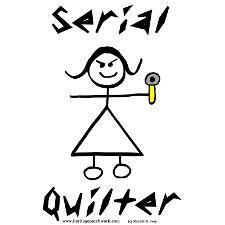 Sorry Kerry's Quilting I'm going to give this one a go myself! What fun we had last night (after we got through the nasty traffic). So much going on that we nearly missed announcing the winners of the Guild's Yearly Challenge. The winners are: Best Applique by Jennifer, Best Paper Pieced by Mary, and Best Pieced by Carol. Congratulations for a splendid job. 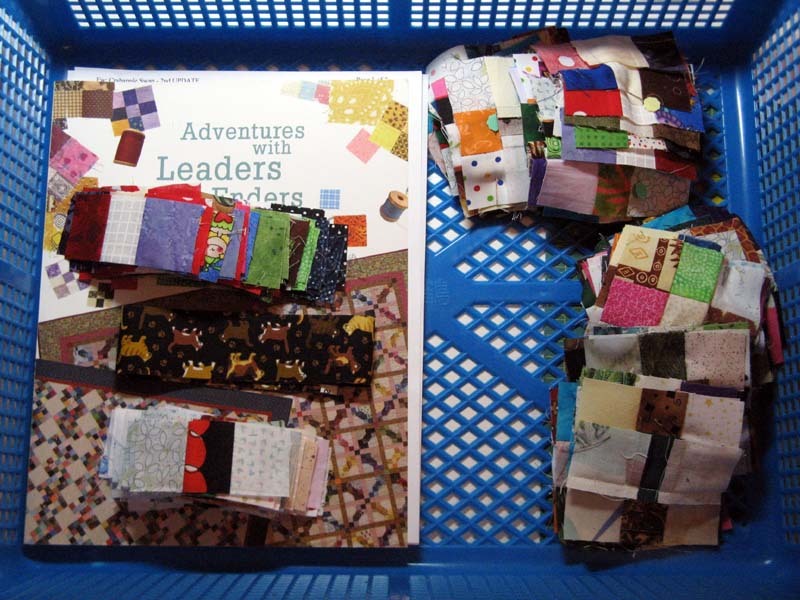 Each received a WINNER Ribbon and a Gift Card to one of the local quilt shops in the area. 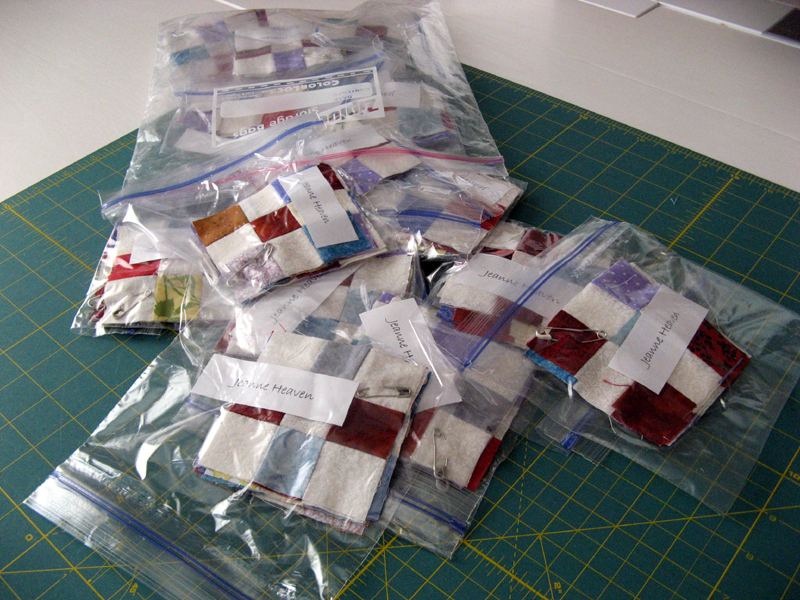 The next part of the project is to assemble the entries into an Opportunity Quilt for 2012-2013. There were not as many blocks turned in as was hoped so the board will discuss how to proceed. There is a group ready to meet to make the star border. We'll wait to see what's next. This is my "Let Freedom Out" offering; an attempt at the Declaration of Independence. The evening also brought lots of 9-patches my way. 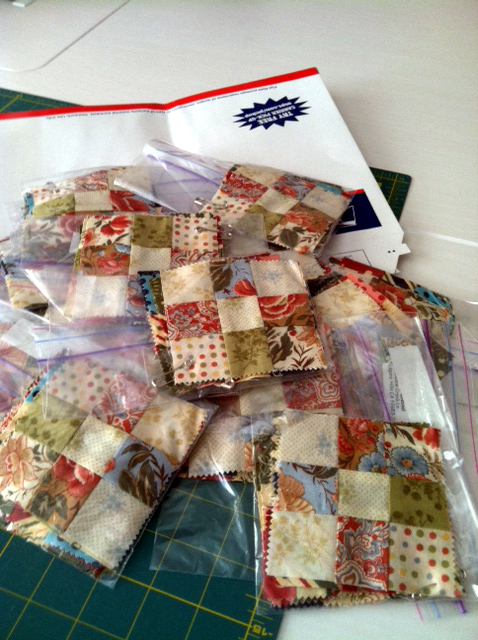 This swap is for the gazillion 9-patches that are needed for Bonnie Hunter's Crabapple design from her last book. Four swappers; Bonnie Sue, Debbie, Debra, and Kerry turned in their swap. At this time I have seven of the 18 that need to find their way to me by the end of June. 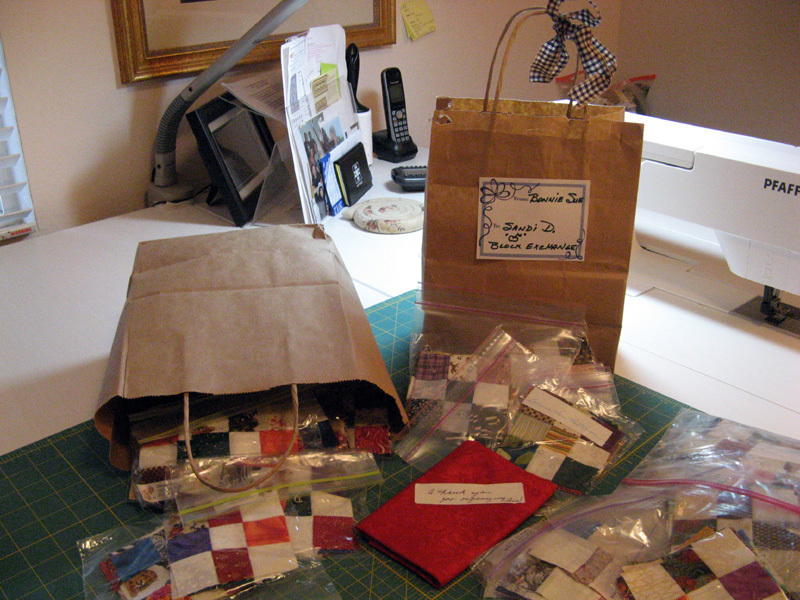 Bonnie Sue was so sweet to me; gifting me with a red batik FQ for organizing the block swap. Thank you Bonnie Sue! 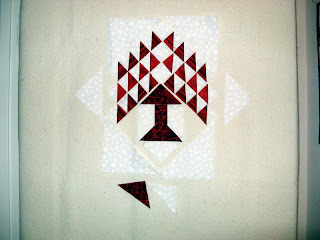 This tulip block was made by my Mom during the retreat last weekend. It was made for the Project Linus Coordinator in her area as a celebration of all her dedication. The only requirement was neutral in color. Mom brought with her a few projects we will be working on together tonight and tomorrow. Both are from block swaps recently completed. Chunky Churndashes and Hot Air Balloons. There are other things being sewn while I'm at work that I'll share with you soon. Last night I had some quilts for Show and Tell that questions were asked about the patterns. Kamile information can be found HERE. Katnip Krazy information can be found HERE and on earlier posts. Wish there were more hours in the day to spend in my sewing room. Have a wonderful day! Joan and Jeanne are next to turn in their Crabapple Swap Blocks. That's three done and in my hands of the 18 that are participating. I'm hearing that more are coming to me tonight...so look for more pictures tomorrow. I know it won't happen, but mine are getting closer. 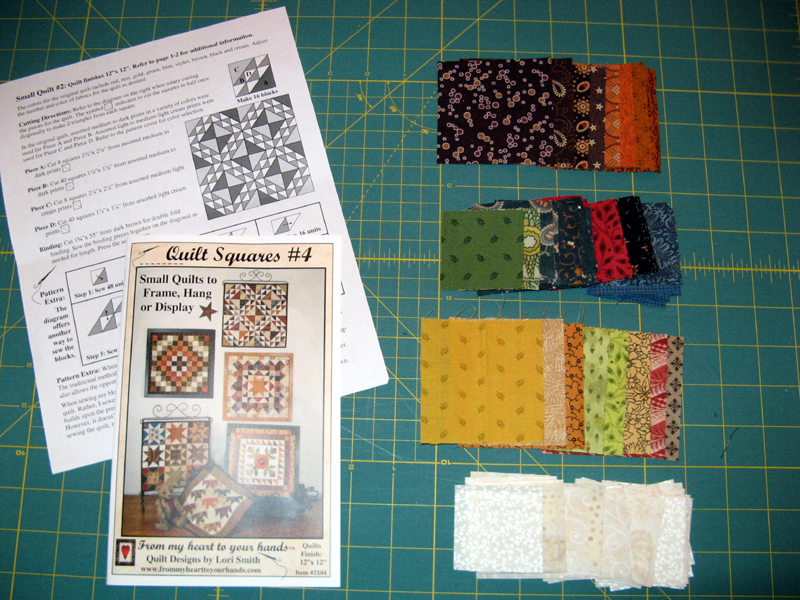 Tonight is Sunshine Quilt Guild meeting. I've got a block of the month to turn in, a challenge block for the yearly challenge, and Gold Coins. Gold Coins is my contribution to the potluck. It's a carrot side dish that's pretty yummy. We've also got an auction planned. A fun evening ahead! Happy Birthday to my Brother Mike and my Nephew Austin! June is a busy month for my family. 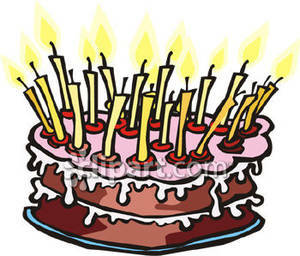 You will be seeing lots of birthday wishes the entire month. This one is a secret. Frankly, even to me until I get busy on it (wink). It is the yearly challenge with Sunshine Quilt Guild and it's due on Tuesday....yep tomorrow! I have the pattern tucked nicely under the feather fabric. I'm anxious to get this one finished. 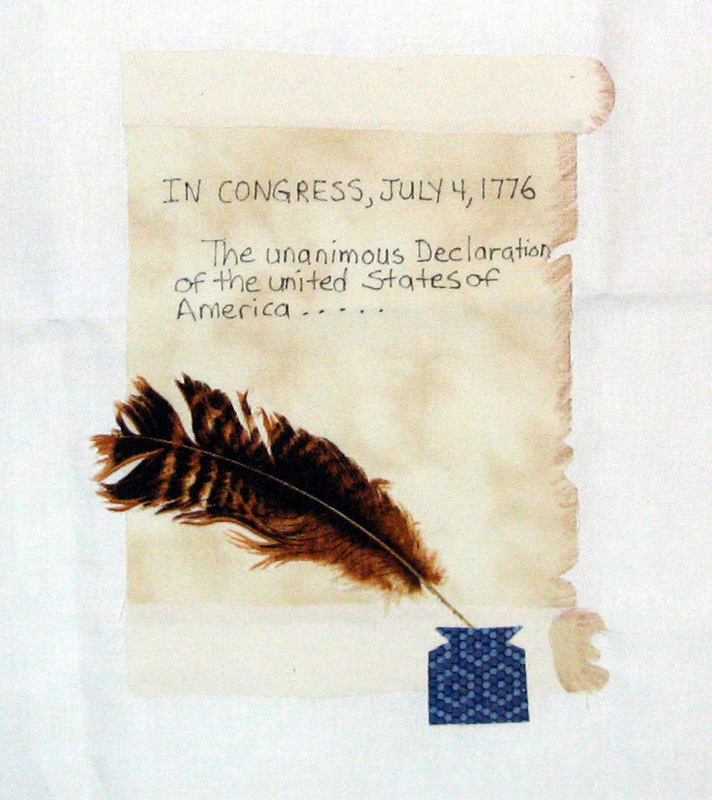 The theme is Freedom. We'll be judged in three categories. 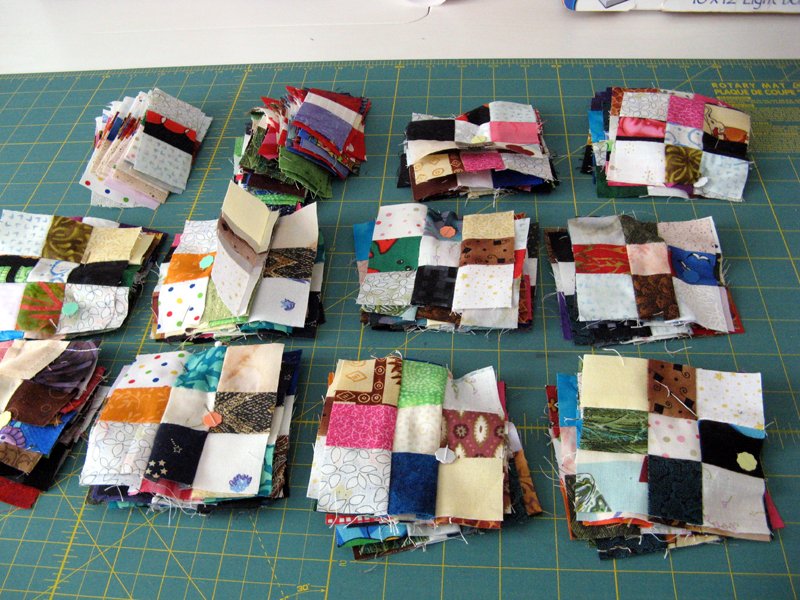 All the blocks will then be assembled into the Opportunity Quilt for 2012-2013. These four blocks are the Block of the Month project. We were to use a red and a white only. Barbara coordinated this fun project. 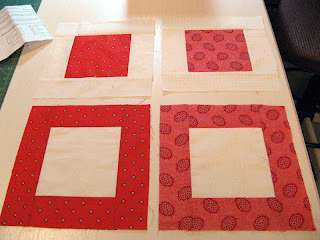 This is my crabapple swap blocks. I've got ten of the 18 sets required. The pieces at the top on the left will hopefully complete the remaining sets...three of us were working on these at the retreat and two turned theirs in finished. Three turned in so far with three I'm pretty certain just days behind. Due date for this project is the end of June. 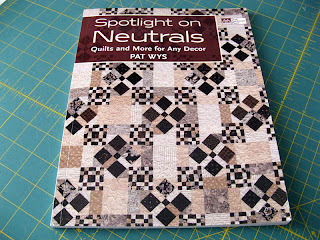 Stop by Wednesday and I'll show you how my challenge block turned out. 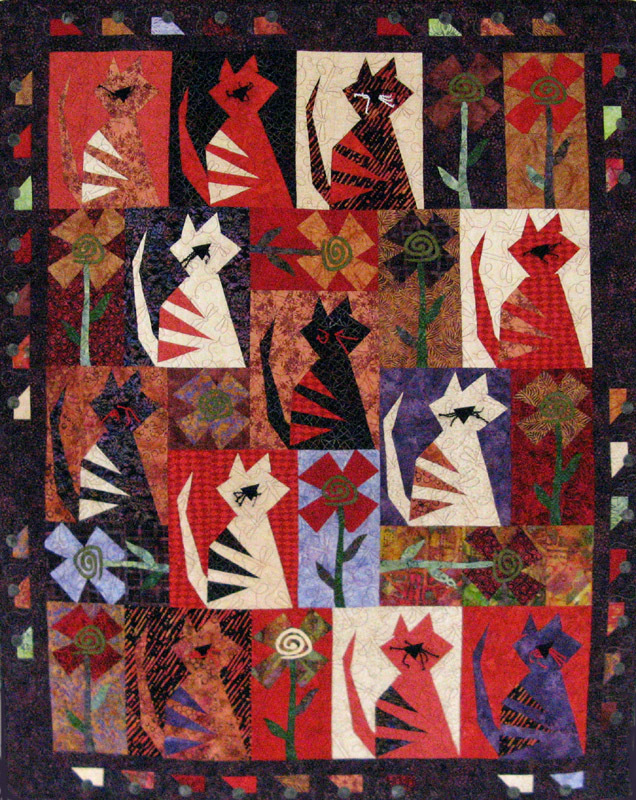 See other great quilting projects at Patchwork Times. Mom has gifted me twice with the purple batik and cool scissors. 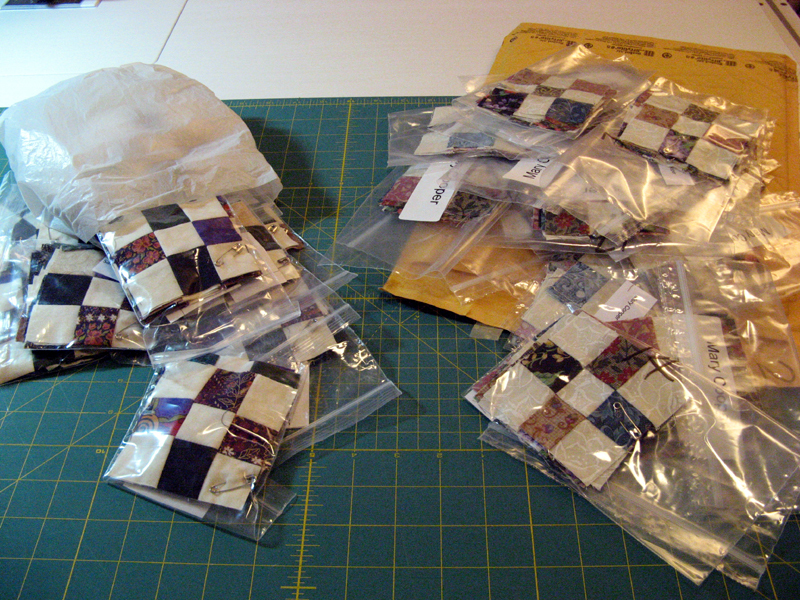 The purple batik came from Old Towne Stitchery a new ownership quilt shop located in Leonard Towne, Maryland. The scissors came from a quilt shop located a bit closer to me. We went there for their monthly club event and everyone who showed up got 15% off any item from their notions wall that morning. These scissors have very tiny serrated blades. I'll be giving them a try in the coming days. Thanks Mom! During Mom's flight out her portable sewing table was broken. She definitely needed one for the retreat so a check on inventory at Rosie's was required. Fortunately they had one and also this new book that Jo's Country Junction recently reviewed. I signed up for the generous give away, knowing my odds of winning...Rosie's has another item less in her inventory. This book holds some fabulous patterns. Of the ten or so designs I'd like to make at least five of them. 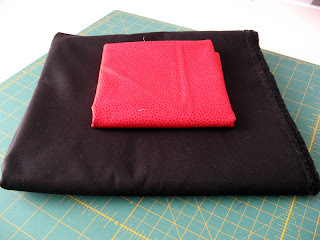 I purchased a 1/2 yard of fabric for my guild challenge from Rosie's too, but it's a secret project I can't quite yet reveal! I did make a couple of purchases building my stash just a bit. The red on the top was a "must" for Knickels. I worked on and finished the quilt during the retreat. We all had fun auditioning the inner border for color. What would you think of blue? Blue along with tan and gold were considered, but the red won out. Cozy's had the red I needed along with a big piece of Kona Black at 20% off since it was end of bolt piece. Come back later this week for pictures of what we worked on at the retreat. 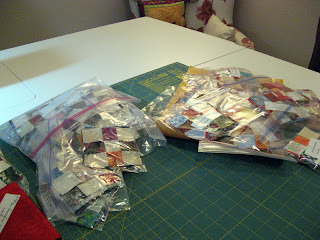 Lot's of quilters reporting in on how they've used their stash at Patchwork Times. 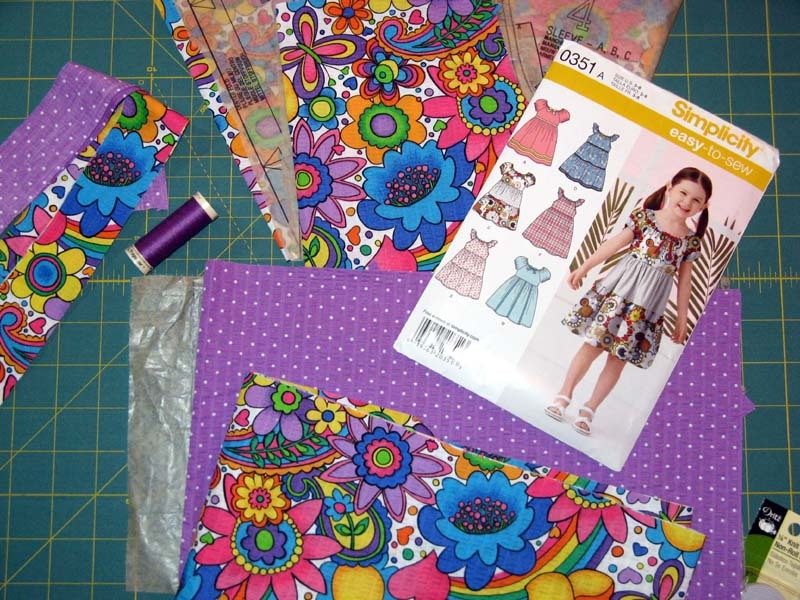 There's going to be some serious sewing going on in Lakeside this weekend. Nine of us are attending our annual quilt retreat. All kinds of things are going to be assembled...perhaps even finished. Nothing like having four days and three nights to do whatever and whenever you want to do it (well maybe more days and nights)! In previous years we've had some rather weird happenings around this ordinarily quiet area. We all joked that the bad guys would be crazy to try to mess with us! We'll be missing several this year that have been there before. This group changes a bit from year to year, but usually everyone returns eventually. Wonder what the list is like for everyone else? Wonder who will be the overachiever this year? Happy June! I have on my wall Knickels. 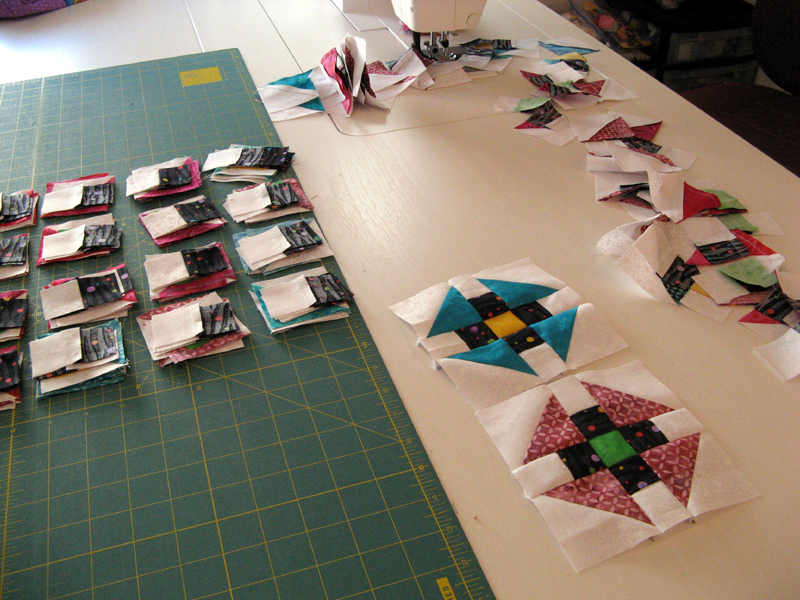 All 80 blocks finished; time now for assembly. 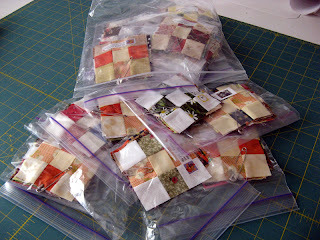 I want to get this together to take with me on the quilting retreat this weekend. 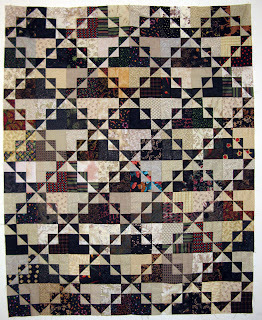 I will be working to finish it with the inner and pieced border that come next. 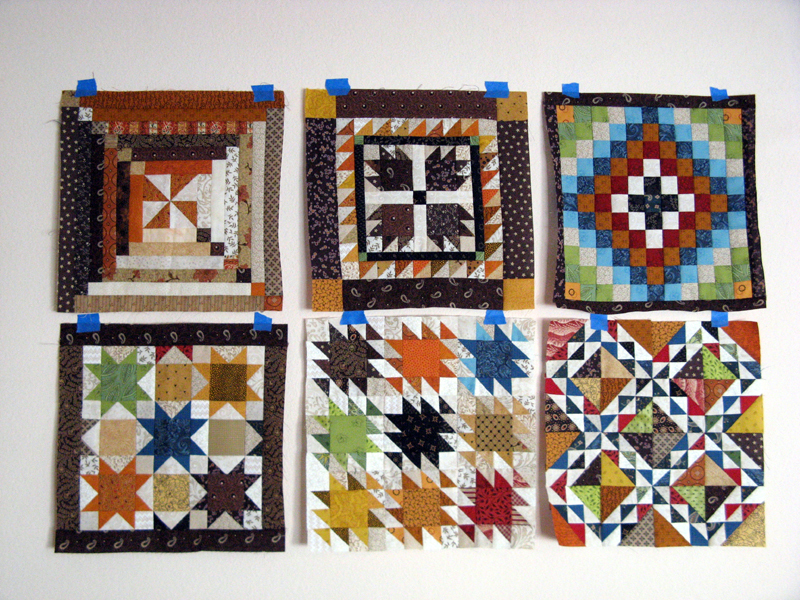 These are the pieces that will be used for the picket fence pieced border. Half of the dark and the light rectangles will be cut in half again making 2 1/2" squares. I'll be using my Sewline pencil next. This is my June UFO with Patchwork Times. The pattern seems to have missed something. None of the pieces are sewn together except the HSTs; suppose things could be different once sewn. But notice that the sides of the tree need more to finish into a block. Also notice that to the right and left of the tree trunk need something to complete its block. The only pieces left are the two triangles. I've got enough fabric to make it work one way or another. That's it from my sewing room for today. My Mom arrives for two weeks tomorrow around noon. It has been too long since we've been together. She will be bringing lots of projects to finish and several waiting to get started on. One project that we will both be working on that's due the end of June is our Crabapple Block Swap. Find time to see other sewing room projects with the links at Patchwork Times. Just finished Katnip Krazy yesterday. I'm ready for the next binding opportunity...Kerry! Kamile was on the long arm when last I heard. It will certainly be a bit easier at night binding Kamile (white) as it won't be dark fabric like Klunky Korners (black) and Katnip Krazy (dark purple). Mom comes to visit from Maryland for two weeks in just two days now. Her flight arrives on Tuesday. I am so excited to be in the same space with her instead of the 3,000 miles that usually separate us. 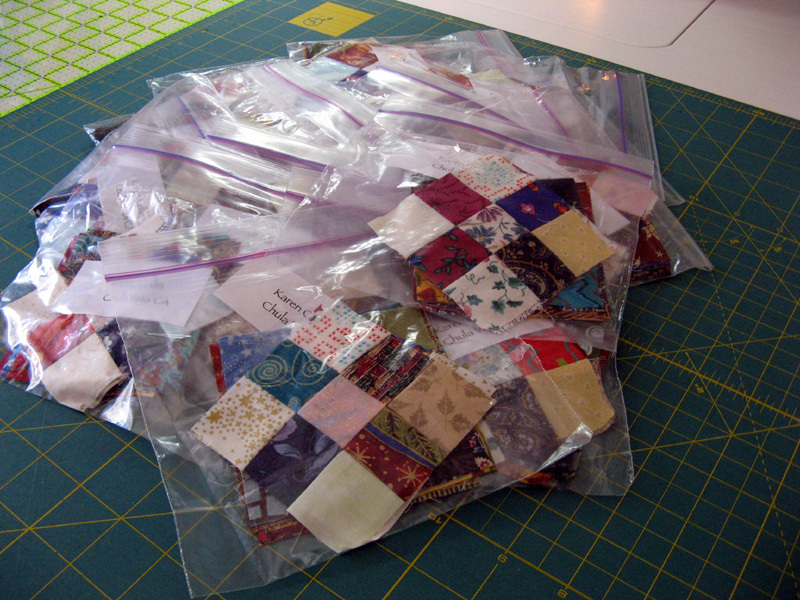 We will be quilt retreating with friends next weekend, so I'll be gathering things to work on in the next few days. At the moment I have plans to finish Knickels, finish my Crabapple Block Swap offering, and start in on the Pawradise quilt for the next San Diego Humane Society Fur Ball donation. I'm sure something else will make its way into the mix. Nothing used and same to say about purchases. A null week...which isn't so bad...as long as it doesn't become a common thing! 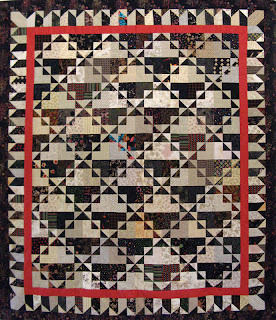 See other quilters using their stash at Patchwork Times. Oh and don't forget Bonnie Hunter is taking pre-orders for her 4th book that will be available in July/August. I've got mine on order already! My two challenges for June have been revealed. 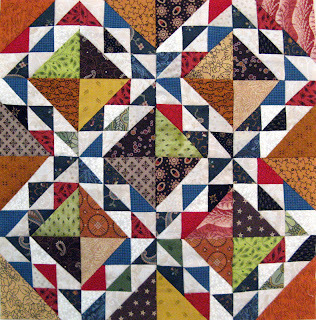 Above is the Tree of Life pattern that is #12 from the 2012 UFO Patchwork Times Challenge. This one should come together very quickly. 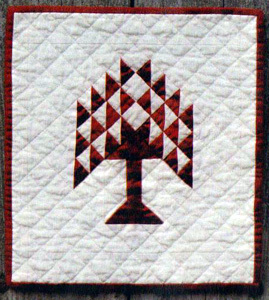 Its a miniature that measures 11" x 13" by the Temecula Quilt Company. I am interested in miniatures, but haven't done many of them yet in my quilting. Not sure what color fabric I'll be using. Any ideas for a "K" name? How about Koppice (coppice) which means a grove of small trees? I'll probably take the extra sewing time during the month to get ahead on one or both of two remaining UFOs that have lots of HSTs, Klowning and Kaktus. Next up is the pattern Corn and Beans that is shown on the right in the top row. 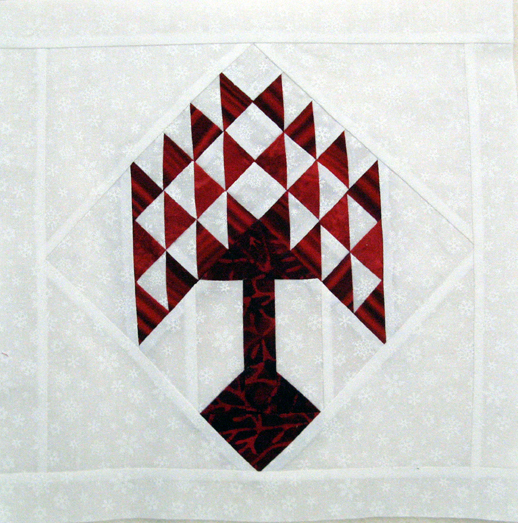 I might bring this one back into more terra cottas and browns like I used in the Log Cabin pattern that was January's block.